We purchased this house almost 12 years ago. At that time, it was a small (less than 1,000 sq. ft.) 2 bed, 1 bath house with a tar and gravel roof. The eaves were in such bad shape that the sky could be seen through many sections. None of the appliances worked, including an electric wall heater. Numerous other components of the house were in bad shape. However, it had been built by a quite competent owner/builder who used quality materials (true 2 x 6 tongue and groove redwood sub-floor, for example), so we decided to buy the house. We had just moved from Pasadena, so while looking over the plans for a second storey addition (the main reason that we purchased the house, along with the fact that it is in a great location), we began talking to the architect that had been hired by the owner. As it turned out, the architect was a Charles Rennie Mackitosh fan, and we changed the style of this non-descript 1961 stucco house to a chalet-style Craftsman (the architect had just completed a project for a client at Lake Tahoe, who wanted a house that reflected the Arts and Crafts era, but also functioned well in the snow). My husband and I, shortly after the process began, became owner / contractors, and designed, worked, and installed nearly all of the Interior woodwork, examples of which include 5/8 x 4 oak baseboards, similar dimension window trim (in layers, which includes square plugs - literally hundreds of square plugs! ), a mahogany handrail a la Stickey - with ebony square plugs, utilitzation of scarf joints, etc., an oak-paneled skylight, redwood doors using a modified cloud-lift design, and narrow double closet doors of redwood. Quite a lot of the redwood is virgin, which we found at building salvage companies, and planed to reveal fantastic straight grain and beautiful color. The crowning elements of the home, however, are lighting fixtures made of mahogany with ebony highlights, which David made - inspired by designs in the Gamble House and other "ultimate bungalows". Some of the lighting fixtures use decorative mahogany ceiling plates and glass fixtures; two wall sconces use hand-blown bungalow art glass shades from Lundberg Studios in Davenport, CA; and several fixtures are basically beautiful suspended boxes with various types of sheet glass - including a sheet of one-of-a-kind iridized glass from Bullseye Glass in Oregon. The fixtures over the dining table and also in the stair landing area are suspended by wide leather straps. David and my son actually wrote for and received written premission to visit the Gamble House after hours so that David could take measurements of some of the fixtures in the house. Our house is quite unique for our area. We live north of Half Moon Bay, in an unincorporated area of the San Mateo County coast, south of Pacifica, and about 25 minutes away from downtown San Francisco. On the greater Coastside, there are probably a handful or two original Craftsman homes, primarily in the town of Half Moon Bay and one other tiny community. 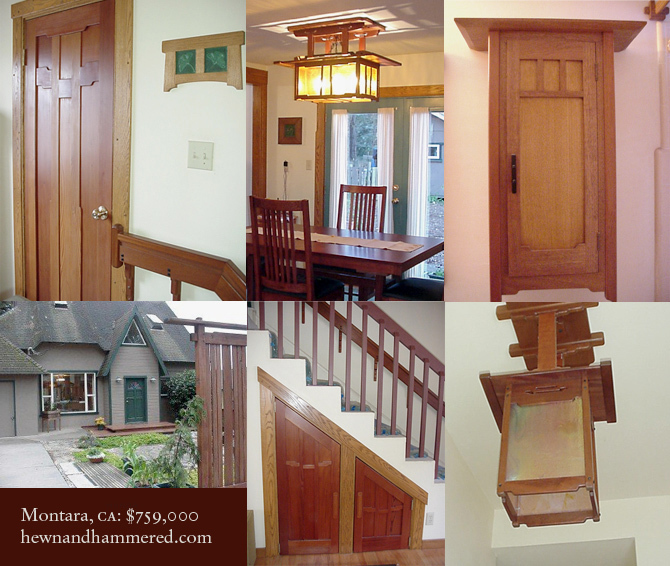 There are some new Craftsman homes, of course, but interior work is often quite contemporary. Our real estate agent, who has worked the coastside for 27+ years, says that she has not ever seen a house like this. Obviously, if you're anywhere nearby, you should stop by (additional photographs are also available at that link) for their next open house on Sunday, December 3 from 11 am to 3 pm. Contact Joyce Beckman at Coldwell Banker Half Moon Bay for more information. 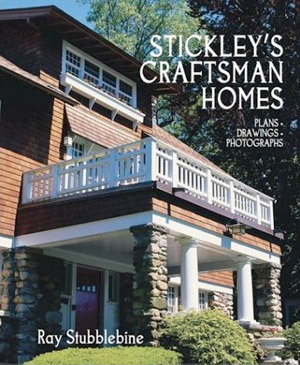 Ray Stubblebine’s new volume, a lifetime’s magnum opus, provides an exhaustive review of the homes promoted by Gustav Stickley over the years of publication of his Craftsman magazine. Published from 1901 to 1915, The Craftsman was a vital component of the first American Arts and Crafts movement, promoting its spirit, theory, and style in a fashion that was far more democratic — far more accessible, and relevant, to ordinary citizens — than its English counterpart. It's kind of pitiful how little original content we have had lately - and I apologize very much for this. My own schedule has precluded me from taking pictures of local bungalows, something I've been intending to do for months, and a few other small projects. To tide you over until next week, here is a rundown of recent (and recently-discovered) articles from various newspapers and magazines which you may find interesting or useful. As always, contributions are appreciated: tell us about your house, send us a picture of your new project, or alert us to interesting work you've seen recently! Slight hyperbole aside ("(t)he nation's premier source of high-quality hand-made ceramic tiles" - you can't fault them for being proud of their product! ), Healdsburg's McIntyre Tile Company does make some of the prettiest A&C tile available anywhere. This should come as no surprise since Bob McIntyre, the founder and CEO of the firm, started his career at Heath Ceramics in Sausalito, where the worlds of art ceramics and mass-produced commercial-grade products intersected. Their 250 glaze colors come in simple primary palettes as well as more specialized series, including a line modeled after the colors of California's own take on the Arts & Crafts movement. Their mosaic tiles come in a huge range of shapes and sizes, from 2" square all the way to 4" x 12" and 6" square sizes, one-cut corners, octagons and hexagons. Now available in paper, Connolly and Wasserman’s Updating Classic America: Bungalows (originally published hardbound in 2002) provides a practical guidebook for homeowners contemplating bungalow renovations, remodels, and enlargements. This handsome, well illustrated volume, is full of useful bungalow information and perspectives - a bit of history, a stab at defining the always illusive bungalow concept, useful sketches of the basic “elements of style,” both internal and external, and a sidebar glossary of basic architectural and building concepts. The heart of the book, though, is a primer for updating bungalows to modern needs and sensibilities - keeping the distinctive and comfortable bungalow essence while adapting for space, light, ventilation, efficiency, and today’s kitchen and bath requirements. One chapter addresses interior remodeling - particularly the opportunities and challenges involved in converting attics into bedrooms, baths, and studies. Another describes the overhaul (“frog to a prince”) of a ramshackle 1912 Seattle bungalow with just 900 square feet of usable living space into a modern tiled, floored, and wainscoted 3000 square foot gem, with the formerly uninhabitable attic and basement converted into useable space. Loaded with bright original photographs, briskly written, with plenty of before and after floor plans and sensible advice, Updating Classic America: Bungalows is a valuable addition to the ever-growing bungalow literature. I've made no secret about my distaste for out-of-scale homes, the faux Craftsman and Tudor mcmansions sprouting up like weeds in the little green space we have left on the peripheries of our cities. But I also have to be honest about my own covetousness - my eyes are greedy. Especially when I see something as beautiful/grotesque as this Southwestern Mission Revival / Craftsman custom home. It is big - at 3850 square feet, it's almost triple the size of my 3-bedroom, 1300 sq ft Mission Revival bungalow here in Sacramento. But the builder doesn't just pay lip service to the Arts & Crafts Movement; all the cabinetry was hand-built onsite by skilled cabinetmakers, and no corners were cut in terms of materials, fixtures or framing. It is a very well-built and well-designed home, with the kind of open, non-compartmentalized floorplan favored today. As the author of a recent article in Custom Builder magazine noted, a blend of two related but distinct styles doesn't always work. Here, though, the designer expertly mixes the obviously southwestern with various benchmarks of the Craftsman style, and the result both fits into a historical niche as well as the surrounding physical landscape - a success by almost any measure I can imagine. Interestingly, the builder used E-Crete (now known as Trustone) structurally and decoratively to a rather unique effect. While we continue to build the Hewn & Hammered Home Store, where you'll be able to buy handmade items from a dozen of the country's greatest craftspeople, you'll have to be content with our Amazon and affiliates shop, accessible from the "shop" link above. We've recently beefed up the Astore with new categories - videos, calendars, a special selection of gifts for the 2006 holiday season, furniture, books and more - and it's definitely worth a check-out. A metropolitan area like Northern California's Bay Area has dozens of great historic neighborhoods full of nice old Craftsman and Mission homes. This means, of course, that there's a market for architects and contractors specializing in work of that style. Other parts of the country are not so lucky - even in areas with a large number of older bungalows, like some parts of Wisconsin and Illinois, only a few local firms may have the experience and interest to take on projects involving historical accuracy. I'm in the process of putting together lists of contractors, architects and landscape designers specializing in Craftsman aesthetic for many American cities; below are a few that I compiled before starting the job of making the more comprehensive lists by metro area. If you have something to add to this list or the under-development master list, please put it in the comment section below. Well, I missed it this year - the tour was two weeks ago - but Los Gatos' annual Historic Homes Tour was a big success, raising money for both the Los Gatos Art and History museums. The $30 tour visited six homes in Los Gatos' historic Glen Ridge neighborhood, which is jam-packed with pretty bungalows and cottages, most of them with interesting Craftsman details. Alastair Dallas of the Los Gatos Observer has a good article and several photographs of the tour; homes from the 2001 tour can be visited, online, through Shari Kaplan's October 2001 article in the Los Gatos Weekly-Times. 22 Glen Ridge Ave.: A two-story cottage-style house, built in 1904 for lawyer William F. Pierce and his family, will have the original architect's drawings displayed in the library. It has two cutaway bay windows, a hipped roof with widow's walk and a front-facing gable over its front porch. Used for years as a rental, the home has been returned to its original single-family status by its current owner, who tore down a 1908 addition to build a new kitchen and bath in that space. 133 Glen Ridge Ave.: Look carefully for the subtle decorative elements on the house built in 1909 by David Crummey, who started the Bean Spray Pump Co., maker of the first high-pressure pump for insecticides. (The company later evolved into San Jose's Food Machinery Corp., a maker of farming equipment and, later, huge military vehicles.) Corner towers have hipped roofs, cantilevered on the front and sides with decorated braces below. A hipped center dormer has exposed rafters under the eaves. Stained glass can be seen in the top panes of the tower windows. And here's where you can see the aforementioned quatrefoil windows. The house retains its original footprint, front facade and entry porch, but the insides have been updated - keeping to the period - by the current owners. 219 Glen Ridge Ave.: More fun architectural details are on the cedar-shingled Craftsman-style house with its recessed porch and side-gable roof, built in 1907 for Frank A. Dixon, superintendent of the San Jose Fruit Packaging Co. Carved rafter "tails" show off the skills of a fine woodworker, and the stonework at the sidewalk is original. Inside, many period features remain, including built-in bookcases and dining room buffet, paneling in the dining room and coved ceilings. The current owners extended the rear of the house to remodel the kitchen and add a family room in the 1990s. 19 Hernandez:The oldest house on the tour was built before 1891 and is known as the family home of "Judge" Fowler, although Thomas Fowler actually was a senator and may have even died before the family moved into the house. The Victorian Queen Anne-style house has cantilevered bay windows on the right front and side, a porch with turned columns and a central, front-facing gable. The current owner has remodeled in period style and added a second story for a master bedroom and bath in the early 2000s. 119 Tait Ave.: The newest house on the tour was built in 1993 to replace a circa-1890 Victorian that was red-tagged and razed after it was knocked off its foundation during the 1989 Loma Prieta earthquake. It has typical Queen Anne-style features such as a bay window, wraparound porch with turned columns and hipped roof - all designed to allow the new construction to fit seamlessly into its neighborhood. The current owner purchased it in 1994. 142 Tait Ave.: What's called the "Rene Doolittle House" was built in 1923, likely by Doolittle himself. About 12 years ago, the second story was added, but the first story retains its original Craftsman features such as the stucco under the gables and braces and the exposed rafter tails. A few bits & pieces of Roycroft, Limbert, Stickley, and various unsigned items are up on Craigslist(s) all over the country right now. As always, it's best to seek the advice of a professional when buying from an unknown seller; they might not be trying to rip you off, but they might not know exactly what they've got, either. Roycroft Campus big weekend coming up! Boice Lydell, a Roycroft collector 'extraordinaire' and expert on Arts & Crafts antiques, will be present at the Roycroft Inn salon this coming Sunday, November 12, from 1:30 to 4 pm. For $5 per item he'll give a professional verbal appraisal of your family heirloom (or, as the Roycroft Campus blog puts it, your "flea market find"). He cannot appraise firearms or coins. Mr. Lydell will also open up the Roycroft Arts Museum on Sunday afternoon for a very special and personal look at part of his extensive collection of Roycroft objects. The following excerpt comes from the Los Angeles Times; you can read Robin McMacken's full article there, and there's also a photo gallery of the Riddle/Ledner house. Kyle Riddle and wife Catherine Ledner’s South Pasadena home, a 2,700-square-foot, two-story bungalow home reflects the turn-of-the-century transition from Victorian architecture to the Craftsman style so well-known in Pasadena. Yet what makes the 1890s home undoubtedly unusual is that it underwent a massive transformation a couple of years ago, making it an intriguing blend of old and modern construction. When Riddle and Ledner purchased the home in July 2000, they were eager to renovate their new residence. Ledner said things went alarmingly awry, however, when they realized the home was not as structurally sound as they had believed. The old-home blues were heightened by the fact that an update in the 1950s had been less than desirable. This January 1999 article by Kristine Carber and Chadine Flood Gong (which includes a guide on tansu shopping) is from Sunset magazine. Read the entire article on findarticles.com. We see them in bedrooms, living rooms, kitchens, and baths - Japanese storage chests and cabinets called tansus. Once found mostly in the homes of connoisseurs of Asian art, the wood chests are rapidly finding a broader market. "Tansus adapt well to the Western home because they blend effectively with contemporary and traditional designs," says Seattle designer Kristine Donovick. San Jose design partners Patricia McDonald and Marcia Moore agree. "We've been using them for years, but now more clients are asking for them because they are so beautiful and versatile," says Moore. Most tansus are square or rectangular, but some, originally used as freestanding staircases, have interesting stepped shapes. They began appearing in Japan in the latter half of the 17th century and were used in houses, for storing clothes and cooking equipment, and on merchant ships, to store documents for safekeeping. By the 1800s, they had become familiar furnishings in Japanese homes. Highly lacquered pieces graced the houses of the nobility; simple wood chests were found in country homes. Most are useful and interesting, but some are a big miss: somehow the folks at HGTV (and many designers all over, unfortunately) think that Craftsman style, which is based on a lack of subterfuge, and the modern trend of hiding appliances, are related. Designer Rick Rivadeneyra and ceramicist Suzanne Sollenne are California natives who sell their tiles and other work through the Coastal Artists ebay store. Their relief and other types of tiles are unmistakably Arts & Crafts, from subject material to glaze. They currently have several dozen different designs available, from relief tiles in striking wooden frames to borders and multi-tile friezes. The stock changes almost every day, so keep an eye on their site!